Independent machinery manufactures are few in the UK at present and the majority of seed treaters are engineered and produced by the agrochemical industry and supplied to the seed trade, generally with the agrochemicals for particular uses (elsworth, 1988). Seed treatment machinery may be static and located at seed houses or it may be mobile and transported onto farms by contractors who treat on site. Jeffs and Tuppen (1986) divide the types of machine used throughout the world for treating seeds into eight groups based on the method of applying the formulation to the seed and the mixing process. The main types of machine recently available in the UK and to an extent elsewhere in the world apply pesticides by (i) drum mixing, (ii) auger mixing, (iii) spinning disc distribution. Not many drum treaters are still used the treatment of cereals in the UK (elsworth, 1988). Their main use was for the application of liquid formulations of organomercurials to seeds. These chemical have been banned for seed treatment use in Europe. A measured dose of liquid chemical was applied to a batch of seed as it passed along a slightly inclined revolving drum. The treated seeds passed into bins or bags. Drum traeters are used for the application of pesticides in powder form to vegetable seeds (maude, 1986) and for treating soyabean seeds (McGee, 1986). Grain is discharged from a hopper metered by paddles passed along an inclined auger conveyor. A powder dispenser is activated when grain is released and mixing of the pesticide ad seed occurs as the seed moves along the auger to be discharged into bins or bags. Drill box treaters sometimes make use of the auger principle for treating and loading the treated grain into drill boxes for sowing (jeffs and tuppen, 1986). In principle liquid formulations of pesticide are delivered to a spinning disc from the edge of which they are dispersed by centrifugal force as filaments which break up into fine droplets and are uniformly distributed onto seeds. The method by which the seeds are presented to the pesticide ‘spray’ is part of engineering technology and serves to identity the main treates available for commercial use in the UK. Otherwise, seeds constantly circulated in the format of a ‘toroidal doughnut’ on the sides of the treatment chamber receive a coarse spray of pesticide from a rotary atomizing disc. 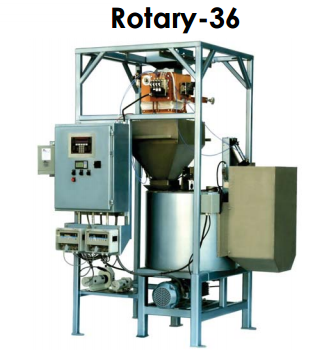 This system of application was introduced with the rotostat-type of batch treater for cereals and has been developed further as a machine for continuous treatment. Maude, R.B,. 1996. Seedborne diseases and their control. New York: CABI publishing. Max. capacity for filmcoating 30,000–48,000 lbs. per hr (depending upon seed type and density). 0 Response to "Seed Treatment Machinery"